'Avengers vs. Thanos' review: An all-ages twist on Thanos – AiPT! Get your Infinity Gauntlet fix with this Marvel Studios comic adaptation. Much like the upcoming Avengers: Infinity War, Marvel Studios latest cartoon-turned-comic reveals a different variation on a classic Marvel tale. In this case, it’s Thanos and his ever-present attempts at taking over Earth, whether it’s with the Infinity Gauntlet or with his Black Order. Not only does this offer up an interesting twist on one of the greatest comic stories ever told, but it captures a variety of different team dynamics not seen anywhere else. Featuring screen-capture images from MARVEL’S AVENGERS ASSEMBLE SEASON TWO! The Avengers face the machinations of the Mad Titan himself — Thanos! And you know he must be bad when even the Red Skull is fleeing from him! Thanos seeks the cosmic Power Stone — but will the robotic Arsenal, built by Tony Stark’s father, help keep it out of the Titan’s grasp? 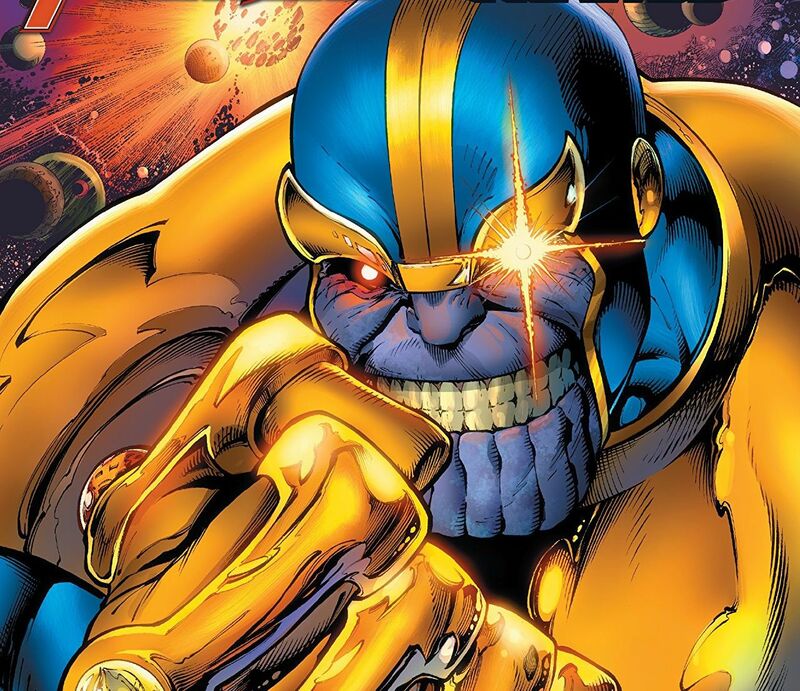 Thanos has targeted all the Stones necessary to form the Infinity Gauntlet — and if he succeeds, he’ll have ultimate power in the palm of his hand! Black Widow has a plan to save the universe — but it will take all of the Avengers to pull it off! Captain America and Iron Man don’t see eye-to-eye, but can they put aside their differences in time to come together for the final battle to save everything? If you’ve seen the cartoon you’ve already experienced this story, but here you get it in a digest comic format as god intended superheroes to be enjoyed. This collection also offers up three two part stories each focuses on Thanos as the villain in different types of adventures. Only an egomaniac would declare themselves ruler of a thing. The three stories in this collection show off various plots by Thanos that mix things up enough so each contains a fresh plot and differing requirements to beat the Mad Titan. The characterization is fun and you can see how it works in an animated format, be it Thanos and Tony Stark competing with rivaling egos, or Thor and Hulk having a brotherly competitive relationship. The book reads well as a whole because of these recurring personalities that give a unique take on each of the characters. The first story deals with Thanos attempting to acquire one of the stones only to be thwarted by a robot made by Tony Stark’s dad named Arsenal. Having not seen the show it came as a surprise to see how prominent Tony’s dad was in the cartoon. The resolution is a clever idea utilizing alternate dimensions and it weaves in The Watcher in a fun way. The second story has Thanos acquiring all the stones due to Black Widow realizing they were corrupting Tony’s mind. It’s a long story, but in it we learn Black Widow has the most resolve of any of the heroes. A neat character wrinkle. It also ends in a clever way, forcing the heroes to fight Thanos one stone power at a time. This is probably as close to the “Infinity Gauntlet” story as the cartoon gets, even though it also contains the Guardians of the Galaxy. The third and final story has the Avengers rush off to save a planet only to leave Earth unprotected from Thanos. This is as Saturday-morning-cartoons as it gets — the collection ends with Iron Man going full-on Megazord against a giant 10 story tall Thanos. This story has a variety of neat ideas though (like Ant-Man shrinking the Earth to hide it from Thanos), and is a pleasurable read. I love the idea of Thor and Hulk competing at video games. There are instances where the screen-captured images don’t do the show justice, reducing the effectiveness of the storytelling. It’s rare, but occasionally panels would be too dark or the movement of a scene was hampered by the scene getting cut up. For the most part it’s not too detrimental, but it’s noticeable here and there. There’s one clunky story beat in this collection involving Doctor Strange. He gets drawn in as Black Widow attempts to hide the Infinity Gauntlet and it gets very weird as a Doctor Strange villain pops in to give the Avengers hell. I don’t know if the show was simply trying to integrate a wider variety of characters or what, but it’s a strange turn that ends up not mattering anyway. This is a fantastic companion to the legend of Thanos. Sure, these stories aren’t in canon, but they’re a fun retelling that add to the mythos of the Infinity Gauntlet and Thanos in general. Get this one for the kiddos to get them properly hyped for Avengers: Infinity War. A strong collection with a unique take on the characters and a fun collection of Thanos battles.